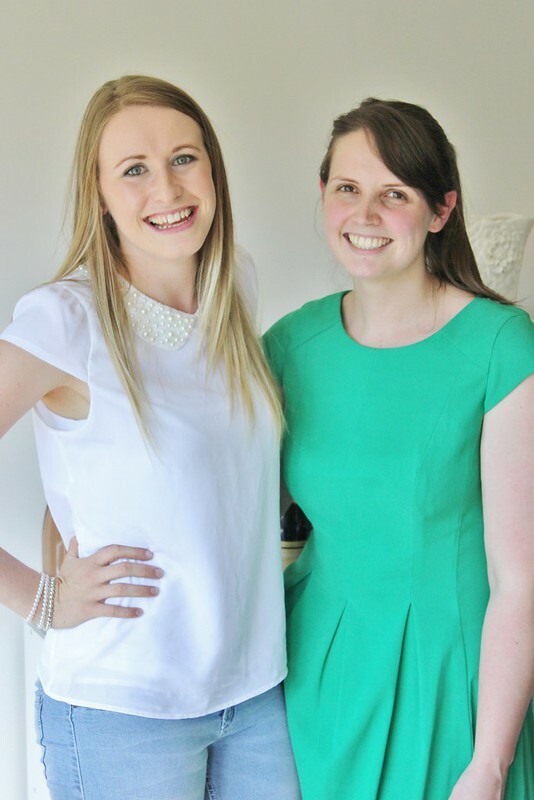 It's Easter Sunday! Hooray, time to eat chocolate! Wait, is that the chocolate day? I never know which day it is you're supposed to eat the chocolate. In our house it's usually as soon as Easter eggs go on sale, which lets face it, is as soon as Christmas is over. 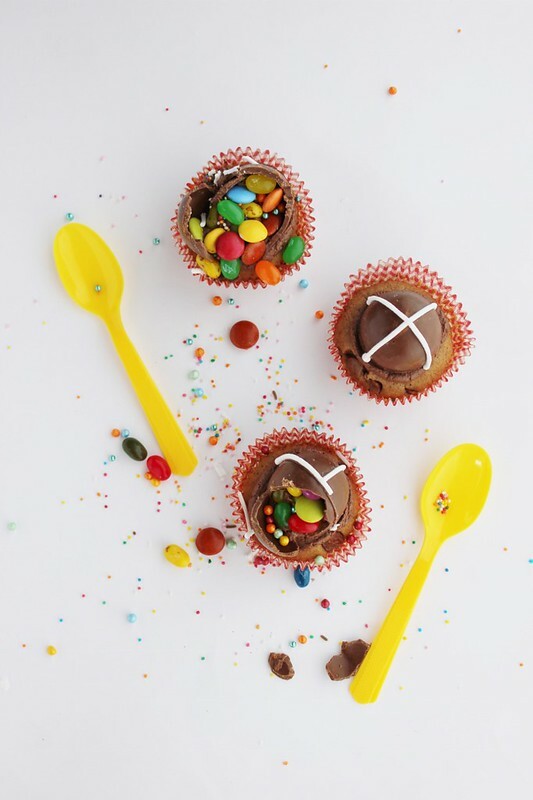 Cue Hot Cross Bun Cupcakes with Easter eggs on top, tah dahhh! 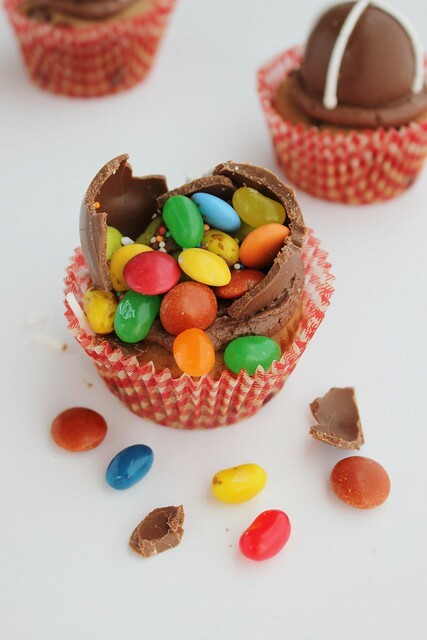 These cute cupcakes are more than a delicious spiced cupcake topped with a hollow chocolate egg, they are also filled with treats so that when you crack open the top they tumble out, just waiting to be eaten! Kirsten from High Tea with Dragons and I came up with these magnificent creations for a competition run through NZGirl (where we both blog occasionally) and we think they're the best invention ever, although we might be a bit biased. 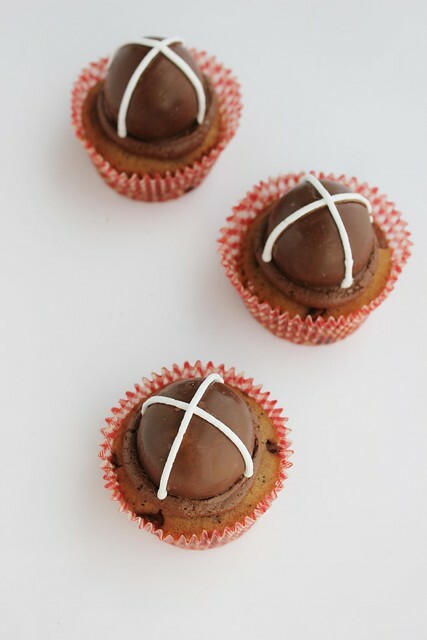 While doing my research for our cupcake/bun hybrid I noticed there really weren't many recipes for hot cross bun flavoured cupcakes. 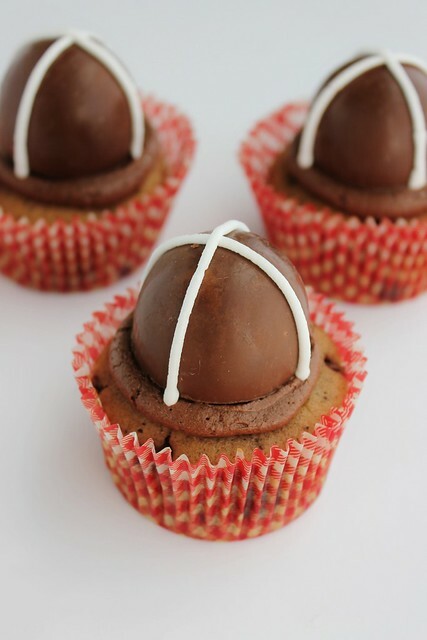 The cupcake recipes I found looked like hot cross buns but weren't flavoured like them. That's where we hit the jackpot. These cupcakes are flavoured with allspice and cinnamon but instead of stuffing raisins and peel inside (no one likes them anyway right?) we threw in some chocolate chips. Genius! ...if we do say so ourselves. 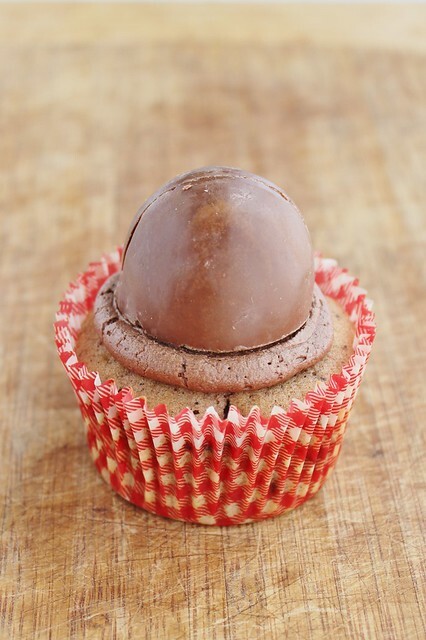 Preheat oven to 190 degrees C and line a muffin tin with cupcake cases. Add eggs one at a time, beating well between each. Sift together flour, baking powder, all spice and ground cinnamon and add to creamed mixture. Add chocolate chips and gently fold through mixture. Fill cupcake cases 2/3 with mixture. Place in oven and bake for 15 minutes or until a skewer comes out clean. Transfer to a rack to cool completely before decorating. Add vanilla to the butter and beat until incorporated. 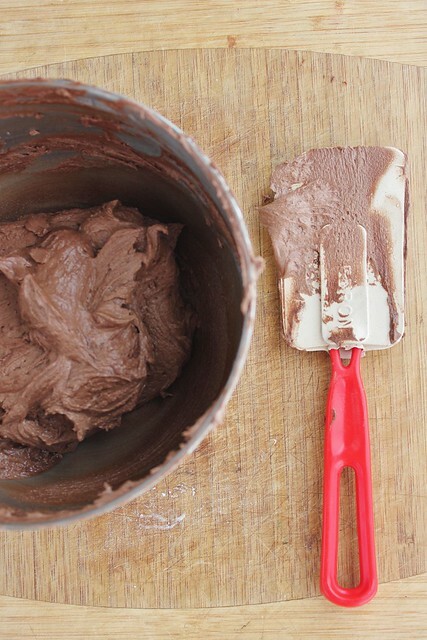 Sift icing sugar and cocoa into a separate bowl. Add dry ingredients to the butter mixture one cup at a time. Mix until lumpy then add milk until you reach a nice soft consistency that you can pipe with. Pipe small round swirls on cupcakes, using a medium sized round tip. Make sure all your equipment is oil free by washing in boiling hot soapy water before beginning. 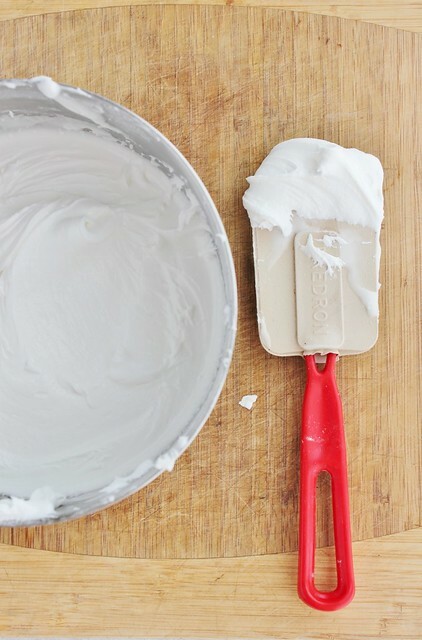 Using a whisk attachment, beat until well incorporated, making sure to scrape down the sides of the bowl as you go. Beat icing on a medium speed for 8 minutes. Cover with a clean damp tea towel and set aside. 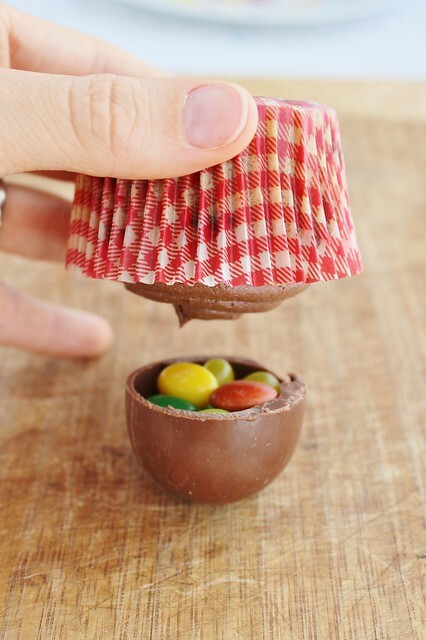 Fill the round side of the Easter egg with treats to the brim. 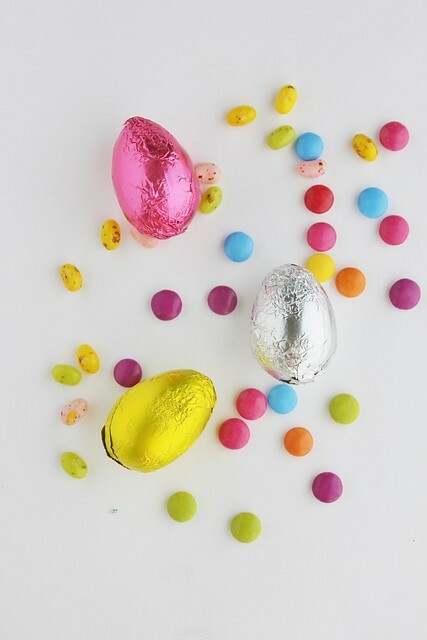 Using a small tip, pipe two lines of royal icing on the Easter egg to make a cross. 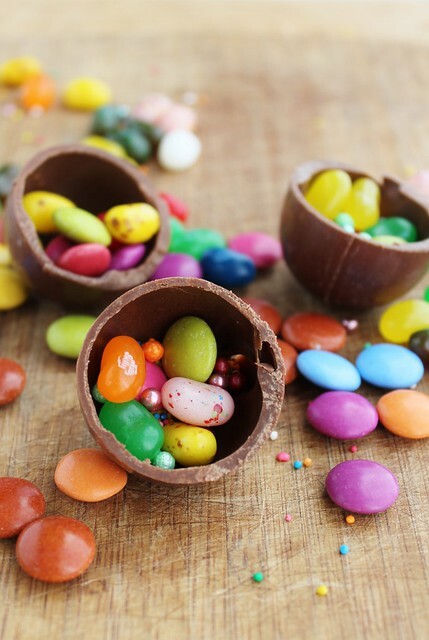 Crack into the egg and enjoy your surprise! Royal icing recipe from about.com, chocolate buttercream recipe adapted from Savoury Sweet Life. 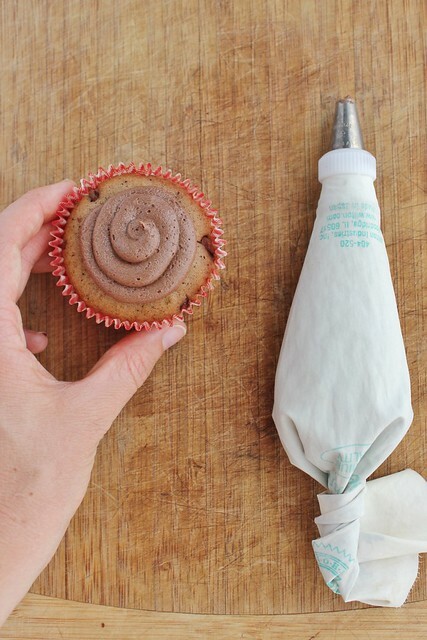 What a great idea and your cupcakes look totally gorgeous!